Over the last few years North American hedge funds have delivered a remarkable recovery from the global financial crisis, both in terms of assets under management (AUM) and performance. The industry has stood apart from hedge funds in other regions by attracting the greatest amount of assets since 2008 and also delivering four years of positive returns. Currently the size of the industry stands at US$1.22 trillion managed by 4688 funds, marking an annualised increase of 12.09% in assets and 6.51% in the fund population since 2000. The industry posted the strongest growth between 2002 and 2008 with AUM increasing from US$370 billion as at end-2002 to US$1.25 trillion by mid-2008. The industry suffered from widespread losses and heavy redemptions by panicked investors during the 2008-09 financial crises, reaching a low of US$849 billion by April 2009. 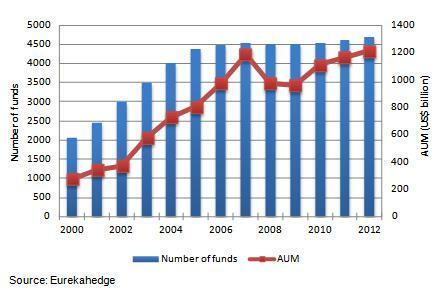 Since then the industry has witnessed a remarkable rebound with the fund population and AUM almost at historically high levels. North American managers posted their strongest annual return in 2009, with the Eurekahedge North American Hedge Fund Index up 24.49%, and between May 2009 and August 2011 the funds also attracted more than US$180 billion through net asset flows.